The spacecraft that will carry three Chinese astronauts into orbit in June arrived at the country's remote desert launch base Sunday for final testing and flight preparations, state media reported. Shipped in two cargo planes flying from Beijing to the Jiuquan space center in northwest China, the Shenzhou 10 spacecraft arrived at the launch base Sunday, according to a report by the state-run China Central Television. Technicians at Jiuquan will assemble Shenzhou 10's orbital, descent and service modules, fuel the spacecraft, and place it on its Long March 2F rocket over the next few months. 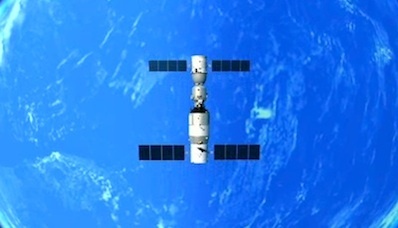 CCTV reported the spacecraft will stay in orbit longer than any other Chinese human space mission to date. China's Shenzhou 9 mission last year lasted nearly 13 days. Chinese officials said in late 2012 the Shenzhou 10 mission would last about 15 days, including 12 days docked to China's Tiangong 1 space laboratory module. Shenzhou 10 will be the fifth piloted mission in China's manned space program. The mission's Long March 2F booster, built by the China Academy of Launch Vehicle Technology, passed a pre-ship review March 19, according to the China Manned Space Engineering Office, an agency managed by the Chinese military. If the schedule keeps with precedent set by previous Shenzhou missions, the two-stage Long March 2F launcher will be transported to Jiuquan, a military facility in the Gobi desert, via train later this month. Chinese officials say the Shenzhou 10 mission will lift off with three astronauts between June and August. The timing of the spacecraft's shipment to the launch site could suggest the flight will occur at the beginning of the two-month window. One of the Shenzhou 10 astronauts will be Wang Yaping, set to become China's second woman in space, according to a report by the Shanghai Daily. Wang is a 35-year-old pilot in the Chinese Air Force. China has not disclosed the identities of Wang's crewmates. The Shenzhou 10 spacecraft will complete manual and automated docking trials with the Tiangong 1 spacecraft, forming a 60-foot-long scientific complex for research experiments and engineering tests. Shenzhou 10 may also make a flyaround of Tiangong 1, an activity not attempted on the Shenzhou 9 flight. The astronauts will also broadcast a science lecture to students from Tiangong 1, according to the China Manned Space Engineering Office. Shenzhou 10 will be the last mission to visit Tiangong 1, which launched in September 2011 and has received an unmanned Shenzhou craft and one crewed vehicle. China is constructing the Tiangong 2 spacecraft for launch in 2014. Tiangong 2 is a second-generation lab module designed to be visited by further astronaut crews for longer-duration missions. A third Tiangong laboratory will launch around 2015 to support crews for 40-day stays and test regenerative life support systems. China plans to launch a multi-module complex the size of Russia's Mir space station by 2020.